Background: Athanasios Koukopoulos proposed the primacy of mania hypothesis (PoM) in a 2006 book chapter and later, in two peer-reviewed papers with Nassir Ghaemi and other collaborators. 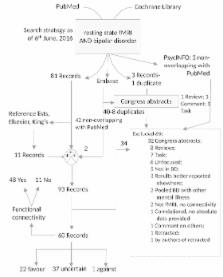 This hypothesis supports that in bipolar disorder, mania leads to depression, while depression does not lead to mania.Objective: To identify evidence in literature that supports or falsifies this hypothesis.Method: We searched the medical literature (PubMed, Embase, PsycINFO, and the Cochrane Library) for peer-reviewed papers on the primacy of mania, the default mode function of the brain in normal people and in bipolar disorder patients, and on illusion superiority until 6 June, 2016. Papers resulting from searches were considered for appropriateness to our objective. We adopted the PRISMA method for our review. The search for consistency with PoM was filtered through the neurobiological results of superiority illusion studies.Results: Out of a grand total of 139 records, 59 were included in our analysis. Of these, 36 were of uncertain value as to the primacy of mania hypothesis, 22 favoured it, and 1 was contrary, but the latter pooled patients in their manic and depressive phases, so to invalidate possible conclusions about its consistency with regard to PoM. All considered studies were not focused on PoM or superiority illusion, hence most of their results were, as expected, unrelated to the circuitry involved in superiority illusion. A considerable amount of evidence is consistent with the hypothesis, although indirectly so. Limitations. Only few studies compared manic with depressive phases, with the majority including patients in euthymia.Conclusion: It is possible that humans have a natural tendency for elation/optimism and positive self-consideration, that are more akin to mania; the depressive state could be a consequence of frustrated or unsustainable mania. This would be consistent with PoM. The neuronal basis and ontogeny of empathy and mind reading: review of literature and implications for future research. Social neuro-science has recently started to investigate the neuronal mechanisms underlying our ability to understand the mental and emotional states of others. In this review, imaging research conducted on theory of mind (ToM or mentalizing) and empathy is selectively reviewed. It is proposed that even though these abilities are often used as synonyms in the literature these capacities represent different abilities that rely on different neuronal circuitry. ToM refers to our ability to understand mental states such as intentions, goals and beliefs, and relies on structures of the temporal lobe and the pre-frontal cortex. In contrast, empathy refers to our ability to share the feelings (emotions and sensations) of others and relies on sensorimotor cortices as well as limbic and para-limbic structures. It is further argued that the concept of empathy as used in lay terms refers to a multi-level construct extending from simple forms of emotion contagion to complex forms of cognitive perspective taking. Future research should investigate the relative contribution of empathizing and mentalizing abilities in the understanding of other people's states. Finally, it is suggested that the abilities to understand other people's thoughts and to share their affects display different ontogenetic trajectories reflecting the different developmental paths of their underlying neural structures. In particular, empathy develops much earlier than mentalizing abilities, because the former relys on limbic structures which develop early in ontogeny, whereas the latter rely on lateral temporal lobe and pre-frontal structures which are among the last to fully mature. This is an open access article licensed under the terms of the Creative Commons Attribution-Non-Commercial 4.0 International Public License (CC BY-NC 4.0) (https://creativecommons.org/licenses/by-nc/4.0/legalcode), which permits unrestricted, non-commercial use, distribution and reproduction in any medium, provided the work is properly cited. Current concepts on the neurobiology of Attention-Deficit/Hyperactivity Disorder. Guanfacine and secondary mania in children.